Well, it's been an exciting week! Back to school and my two oldest grandsons started school for the first time. My little 3 year old granddaughter came down with a virus - doctors aren't sure if it's Fifth's Disease or Hand, Foot and Mouth, but the poor little thing is so uncomfortable. She won't let anyone touch her. Of course, that meant her brother, who was really enjoying Kindergarten, had to stay at home, which upset him a lot! And we had a new forest fire start this week, too, only 10 km from us. Luckily, after the first night, it started burning away from us, not toward us! On my Sahara Sand card base, I used two different designs from the Year of Cheer Specialty Designer Series Paper for the top panels. I just love the mixed metallics in these papers. We have champagne, copper, gold and silver right here between these two designs! I cut one of the silver Foil Snowflakes in half and mounted it behind the front panel, separated so that you could see more of it, but not so much that it extends beyond the edges of the card. I used the Cheers to the Year stamp set to stamp the circle and the sentiment within it. 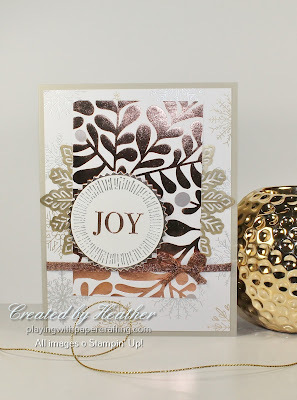 I embossed them in Silver and Copper Stampin' Emboss Powder. I punched it out with the 2" Circle Punch and also punched a backing from a Champagne Foil Sheet with the Starburst Punch. The ribbon I used is the 1/4" Copper Trim. It was a little tricky to tie a bow with, mostly because the ends didn't trim straight very well because it is a copper mesh, rather than a solid ribbon. 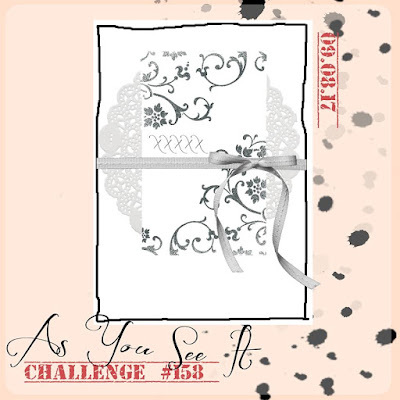 I did tie the bow separately and I attached it to the card with a Glue Dot. This is your last weekend to get in on this promotion! 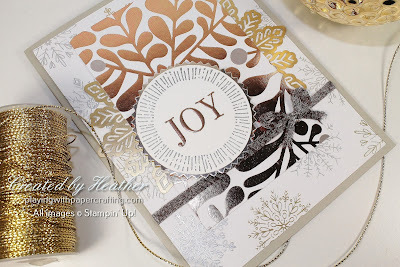 I had a Paper Pumpkin Party last night and my attendees were so impressed with Stampin' Up! 's subscription service that more than half of my attendees signed up to be subscribers there and then! 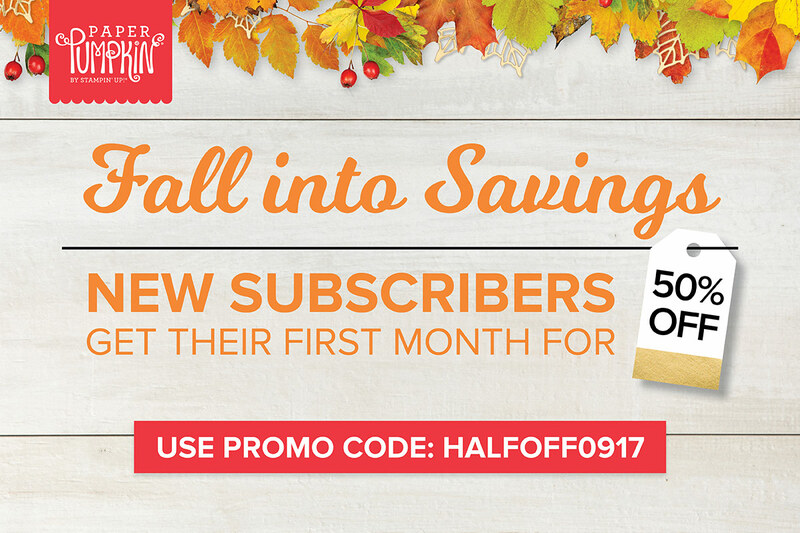 If you are a new subscriber, you can get your first month's subscription for 50% off - only $13.50! But you must sign up before September 10. It's very easy to do. Just go to PaperPumpkin.com and click on the Canadian site, then enter your info and the Promo Code: HALFOFF0917. When you click SUBSCRIBE, you'll have a chance to choose me as your demonstrator by typing in my name into the demonstrator locator. If you do, I will provide you with sites to find ideas and instructions and alternatives and I will be there to answer any questions you may have.